Recorded on 21st March 2011, in London. Michael Esposito was born in Gary, Indiana in 1964. He is a descendant of Alfred Vail who invented the Morse Code and several early telegraph devices together with his partner Samuel Morse. Another ancestor, Jonathan Harned Vail was office manager and assistant to Thomas Edison, then in his later years when he attempted to develop a device for communicating with the dead. Michael studied communication theory at Purdue University, University of Notre Dame, American University in Cairo, Egypt and Governor’s State University. Over the years, under the Phantom Airwaves Institution, Michael has participated in hundreds of paranormal investigations all over the world. He has conducted extensive research at numerous locations and has devised many experiments within the field of Electronic Voice Phenomena, collecting tens of thousands of recordings and video. Working extensively with EVP’s relationship to experimental music, Michael combines EVP with field recording and related frequency tones of research sites. 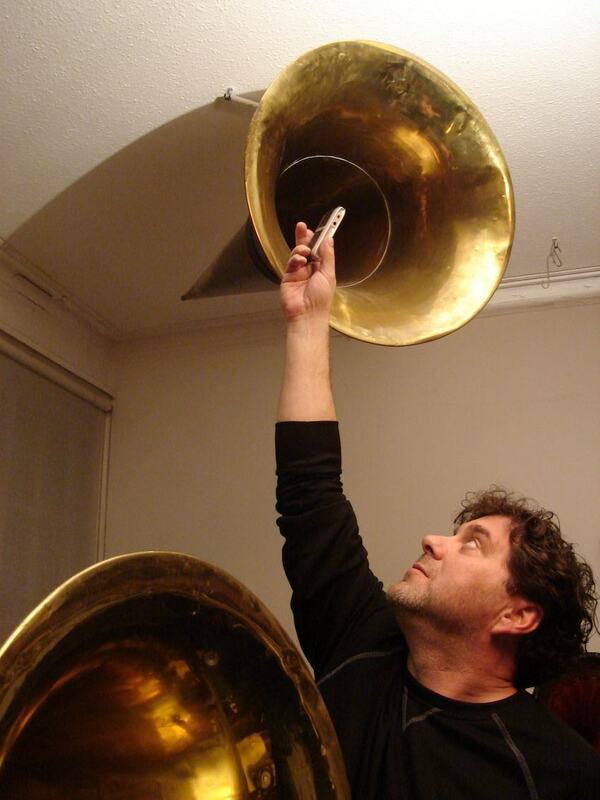 On visiting my studio, Michael was fascinated by the various giant phonograph horns hanging from my ceiling, as they reminded him of the spirit trumpets used by so-called “Trumpet Mediums” to enable the dead to communicate with the living. He recorded the ambient sounds of the room at the mouth of the largest horn with a digital device, we also left the motors of two phonographs running during the recordings. On playback, we distinctly heard occasional sounds that, when magnified, resembled speech. Michael extracted the most prominent of these and I have arranged them together with the sounds of the phonographs revolving in the background.